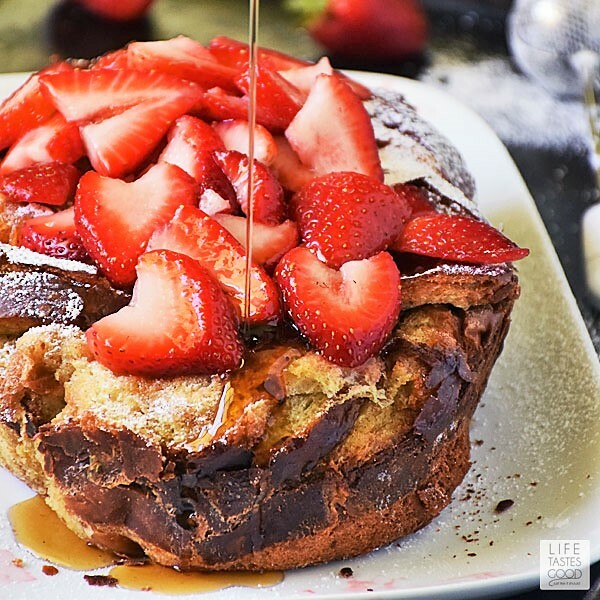 Slow Cooker French Toast is quite possibly the easiest brunch recipe you haven't made yet! Everything goes into the slow cooker and in a few hours you have an impressive loaf of French Toast ready to serve. It's French Toast Friday! We are making French Toast Friday a thing from now until the end of 2018! We kicked off French Toast Friday on October 5th with our Bananas Foster French Toast and there's many more to come like our Alton Brown French Toast, as well as the scrumptious Creme Brulee French Toast. Be sure to join our email list to get all of the French Toast recipes delivered via email as soon as they are published & just in time for the weekend. It's free! Click here to join. Slightly crispy on the outside with a creamy custard inside, this Slow Cooker French Toast is a real treat! 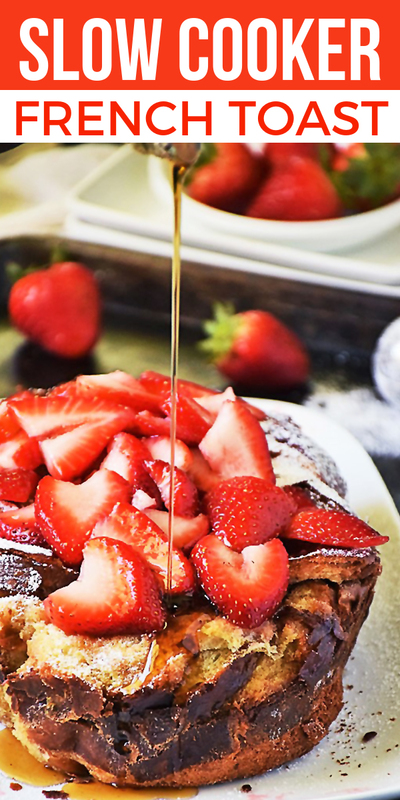 I like to top this French toast with fresh fruit like strawberries or bananas, but just about any fresh fruit will do! The cinnamon and vanilla flavor of this easy french toast recipe pairs perfectly with fresh fruit and maple syrup. I make this Slow Cooker French Toast whenever I host brunch at my house because it basically makes itself. By making French toast in the slow cooker, it frees me up to make another dish that requires a little more attention such as my Eggs Benedict Pizza or Poached Eggs on Toast with Avocado. This Slow Cooker French Toast recipe is truly the easiest brunch recipe in my recipe box. Don't do brunch without this recipe! 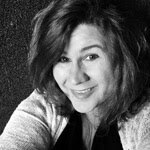 Is Slow Cooker French Toast Soggy? Surprisingly, Slow Cooker French Toast is not soggy at all. As a matter of fact, the French Toast cooks up nicely in the slow cooker. The outside is slightly crispy and the inside is the dreamiest creamy custard texture you want for perfect French toast! 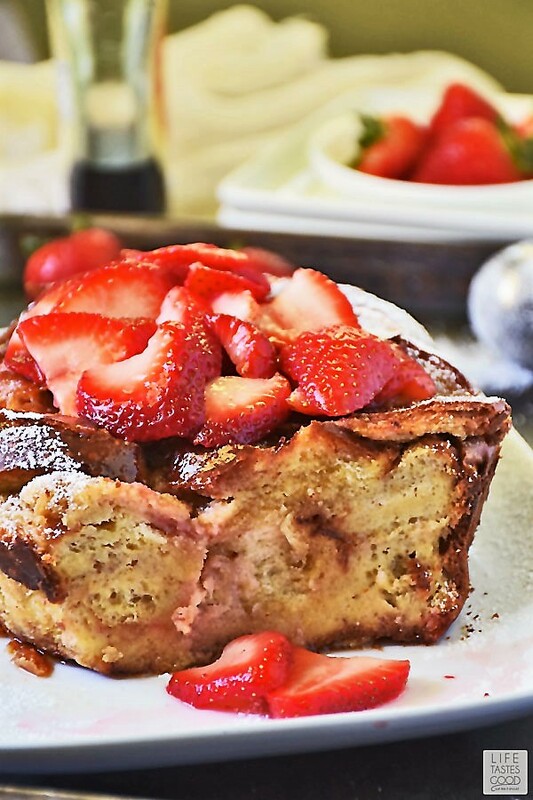 I'm telling you, you are going to absolutely LOVE this Slow Cooker French Toast. It will very likely become your GO-TO French toast recipe, because this French toast is so super easy it frees you up to enjoy your morning or make an additional brunch item. 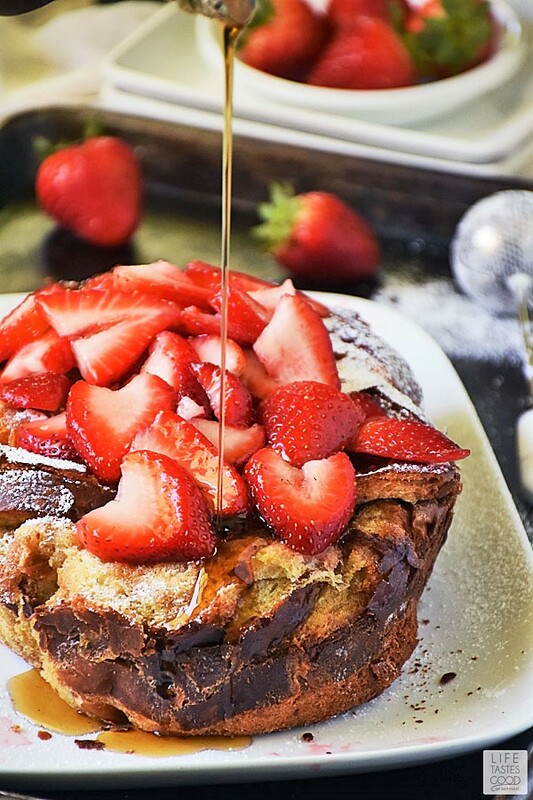 Go ahead and make this Slow Cooker French Toast this weekend! You're worth it! Slow Cooker French Toast is super easy to make! For best results use a 16 ounce loaf of thick bread such as a Pullman bread, Challah bread, or Brioche. If you have a Publix nearby, I recommend the Publix Homestyle White Bread available in the bakery. It is perfect for French toast. This bread has a slightly sweet flavor and the perfect texture for French toast. TIP: I try to buy the un-sliced loaf of bread so I can slice it on the thick side. However, if you can only find a pre-sliced loaf, it still totally works for this Slow Cooker French Toast recipe. Slice the bread into thick slices approximately 1" thick and allow the bread to dry out a bit. I slice the bread and place on a baking sheet overnight. Place the baking sheet in a cold oven if you have pets that might be able to get to it. Spray the slow cooker crockpot liberally with cooking spray or grease with butter. I use Baker's Joy for best results. 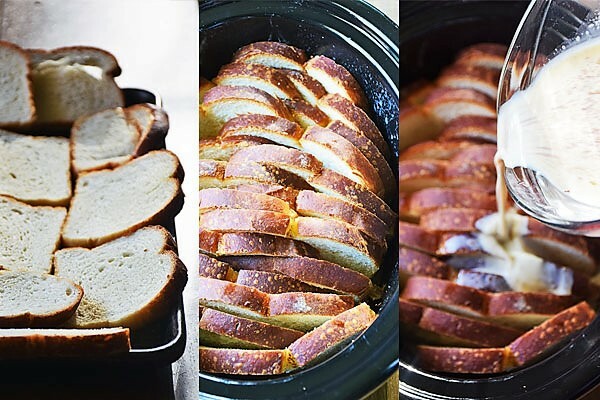 Stand the bread slices up in the slow cooker crockpot, layering the slices the length of the slow cooker, not top to bottom. See my picture below for a visual reference. Whisk the eggs, milk, and cream together well and then mix in the sugar, cinnamon, vanilla, and salt. Pour the egg mixture over the bread slices in the slow cooker. Gently push down on the bread so the top gets coated with the egg mixture. Put the lid on the slow cooker and set it to low for 3 hours. After 3 hours, unplug the slow cooker and run a butter knife around the edge of the French toast loaf and carefully remove the French Toast from the slow cooker crockpot. 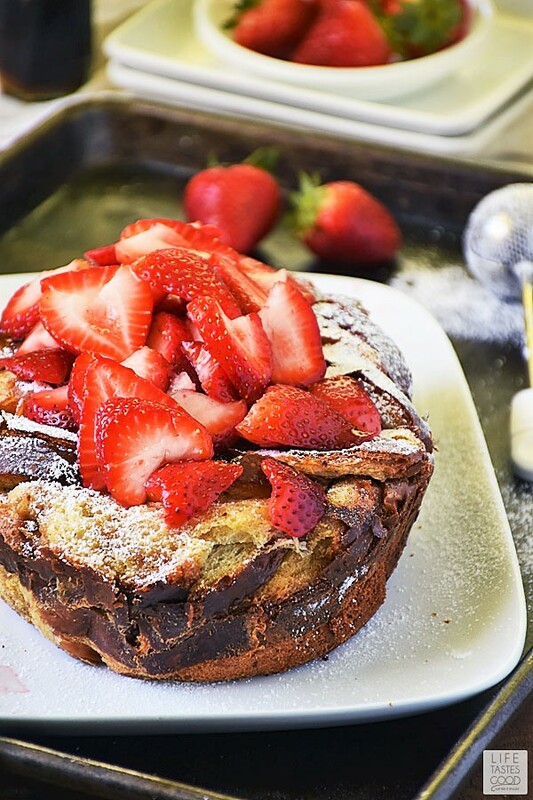 Sprinkle powdered sugar on the French Toast loaf and top with fresh fruit. Serve with maple syrup and enjoy! Most home cooks will already have many of the tools needed to make this recipe, but for your convenience I've listed the tools I use when making my Slow Cooker French Toast. Just click on the item name and find the product I use on Amazon. Stand the bread slices up in the slow cooker crockpot, layering the slices the length of the slow cooker, not top to bottom. Refer to photo above for reference. In a 1 quart measuring cup, Whisk 3 eggs, 1/2 cup milk, and 1/2 cup heavy cream together well. Add 2 tbsp sugar, 1 tbsp cinnamon, 1 tsp vanilla, and a pinch of kosher salt and whisk to blend. Pour the egg mixture over the bread slices in the slow cooker. Gently push down on the bread so the top gets coated with egg mixture. Put lid on slow cooker and set to low for 3 hours. After 3 hours, unplug the slow cooker and carefully run a knife around the edge of the French toast loaf and carefully remove the French Toast from the slow cooker crockpot. Place French toast loaf on serving tray. Dust powdered sugar on the French Toast loaf and top with fresh fruit if desired. Serve with maple syrup and enjoy!